Composer Javier Navarrete is no stranger to fantasy and certainly no stranger to film director Guillermo Del Toro. Their previous collaboration back in 2001 - the intelligent ghost drama "The Devil's Backbone" - was hugely satisfying. Many music critics consider it the perfect introduction to the composer's music, despite the fact that Navarrete had already composed 20 scores by this time. This shows that a composer's success sadly depends on that of a filmaker most of the time. With the highly acclaimed Pan's Labyrinth, Javier Navarrete was finally given proper worldwide exposure and the music easily deserved its oscar-nomination. The music builds out of a child-like innocence but delves into some dark corners of the imagination. The film swings between a fantasy world and the real world, but just how do these two story-lines fit together? The score opens with the beautiful track "Long, Long Time Ago". The words minimal, soft, peaceful, and subttle come to mind here. A beautiful woman's voice hums a soft tune to accompany the strings. A mother singing her child to sleep comes to mind. This kind of warmth and child-like quality appears throughout the soundtrack, perfectly contrasted with darker moments that evoke our own childhood fear of the dark and monsters at the bottom of our beds. This simple lullaby theme may also remind listeners of John Williams, though minus the complexity and flamboyance of his arrangements. Although emerging from the same thematic material, "Labyrinth" has more of a sweeping romantic pulse to it. The piano starts off with simple patterns of mesmerising beauty and develops very slowly into a dark operatic piece. Tracks like these demonstrate the amazing talents of Javier Navarrete. "A Book of Blood" takes us deeper into Navarrete's imagination. This time around we enter the realm of nightmares. Monks chant a macabre lullaby in the background while menacing drones wash in and out. "Deep Forest" takes us through similar territory, with the addition of thundering but distant drums and powerful string sections. These two tracks represent the album's dark core as well as some of the most entrancing and complex pieces on the score. 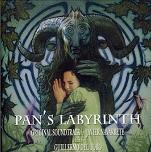 The score finishes in the most beautiful fashion with the tear-inducing "Pan's Labyrinth Lullaby". The main theme is played out one last time with passion, bringing our hearts to a stop and this soundtrack to a close. This is a mesmeric score which pulls you into its world of fantasy - musical story-telling of the highest calibre. As explained by the director on the sleeve-notes, this album contains all of the recorded music although some of it had to be discarded from the film soundtrack. The CD is available in at the following sites: Amazon.co.uk and Amazon.com.